11/15/14 - 899 Panigale and Monster 821! RentaDucati.com is very pleased to announce two new motorcycles to be added to our rental fleet. With its many excellent reviews and write-ups, we bring you the 899 Panigale (info page). The 'little brother' to the 1199, the 899 Panigale gives you the same fully adjustable electronic options as on the 1199: 3 engine modes (Race, Sport, and Wet), Traction Control, and ABS, and provides just the right balance of power, weight, handling, braking, and overall smoothness to make it perhaps the very best sport motorcycle available today. We also have the 2015 Monster 821 (info page) awaiting you! This great Monster package takes the 821 motor used in the Hypermotard 821, and places it in a new Monster chassis with an adjustable seat offering up to 1 inch of seat-height movement. Also included is the full electronics and safety package providing you with 3 engine modes (Sport, Touring, and Urban), Traction Control, and ABS. If you have always like the Monster line up, you will love this bike! Whatever your ride preference, email us or call us (818-395-3648) to get your reservation in place! 5/15/14 - Another Monster 696, Upgrades to ST3, and More Motorcycles Soon! Due to overwhelming popularity, RentaDucati.com is pleased to announce the addition of another Monster 696 (link) to our rental fleet! With a low seat height, easy-to-reach bars, and sporting character, the Monster continues to be one of our most popular rentals. 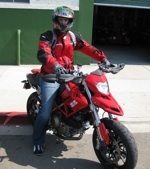 If you have not had an opportunity to ride a Ducati Monster, we have just improved your chances to do so. Due to our ST3's popularity, we have added some significant upgrades. The ST3 (link), Ducati's original (some say best!) Sport-Touring motorcycle, is a gentleman's sport-touring motorcycle with a potent but very smooth 1000cc 3-valve Desmo engine and Ducati panniers. To make it even better, we have added a Fast by Ferracci Forza exhaust and an Ohlins adjustable shock. So now, the ST3 has plenty of torque, power, handling, and comfort to get you and a passenger where you want to be in typical Ducati style, whether on the highway or on a twisty mountain road! 12/15/13 - ST3 With Bags in Red Now Available! RentaDucati.com is very pleased to announce the addition of a venerable and much-loved sport-touring bike to our fleet! Please say ciao e benvenuto to our Ducati ST3 (info page)! This wonderful motorcycle is great for solo or two-up riding in the canyons or on the highway! Our ST3 model features a large windscreen, clip-on bars with 3-inch risers for an easy reach, a comfy seat for one or two, and optional hard bags to get you and your partner up the road in comfort and Ducati style! Reserve it now! 3/30/13 - Monster 620 Dark Now Available! Adding to our Monster collection, a great Monster Dark 620 (info page) is now available for rent. The low seat height makes it easy for anyone to ride, but still has all the performance you expect from a Ducati! 12/2/12 - Custom 916 Now Available! A beautiful custom Ducati 916! (info page) This bike, designed by Massimo Tamburini, is the grandaddy of the 9 series (916, 996, 998, 748, 1098, 848, 1198). Want to know what an old-school race bike feels like? If so, then this is the bike for you! 11/1/12 - Multistrada 1200 w/ ABS! We just added a new beast to our fleet... a very nice Multistrada 1200 with ABS and bags (info page). Perfect for touring, perfect for canyons, perfect for anything SoCal can throw at it! So grab your riding partner, plan your weekend getaway, and book your ride today! 7/4/12 - New OC Location - SBK Corse! Announcing our newest location in Orange County, CA at SBK Corse! (info page) Specializing in high performance parts and service, if you are looking to improve the handling and reliability of your street bike or to take it to the track, SBK Corse has you covered. SBK Corse is located just off the 5 Fwy at Lake Forest, only minutes from Laguna Beach, PCH, and Ortega Hwy! 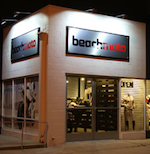 6/22/12 - New LA Location - Beach Moto! 6/12/12 - 1199 Panigale is here!!! After months of anticipation, our brand new 1199 Panigale is finally here and ready for rent! Check out David Johnson in this YouTube video walkaround of this amazing bike while up at Newcombe's Ranch. Ready to ride this 195 horsepower beast? Book now (link)! Unfortunately we will no longer be running reservations out of Pro Italia in Los Angeles. All confirmed renters will be processed there, but we are not taking new reservations at that location. We will have a new LA location announced very soon so you can enjoy LA this summer. Stay tuned for more details. Please email us if you have any questions about a rental in the meantime. You read that right... our 1199 Panigale (info) bike deposit is in! We're expecing this amazing machine, the latest coming out of Borgo Panigale, perhaps as early as March, and will be running it out of our Los Angeles Pro Italia location. Keep your eyes pealed for intro details, and join our mailing list to the right to get release and promotional discount info. Stay tuned! We hope everyone has been having a great summer! We just returned from Laguna Seca Moto GP slightly sunburned but had a great time. The highlight being the Ducati sponsored track walk led by Jason DiSalvo! Check out our Facebook page for photos. We highlighted last month our new rental location at Pro Italia in Los Angeles. In addition to the new Diavel we also have a brand new 2011 Multistrada 1200 ABS (with bags) available to rent! If you haven't ridden this amazing bike, you are in for a big surprise because it is as comfortable as any touring bike, but corners like a sport bike. With 150 bhp on tap, and 4 engine-mapped riding modes (Urban, Enduro, Touring, and Sport), adjustable traction control, and full ABS, this bike really does cover new technological grounds. If you didn't catch the Ducati Experience Tour you now have both a Diavel and a Multistrada 1200 ABS available in Los Angeles to spend a whole day or a whole weekend riding. Or, grab one for a week if you really want to get away. Enjoy! 7/9/11 - New Los Angeles Location!!! Pro Italia Motorcycles, in Glendale, CA, is RentaDucati.com's newest rental location. As many of you know, we have wanted to have a Los Angeles area location for a long time and we are very happy to finally have that with an organization that has a great reputation like Pro Italia. Our website is updated and we are now taking reservations for the Diavel with the first rental date scheduled for next Friday, July 15th! So, if you took a test ride, but still aren't convinced, this is your chance to spend a whole day, or better yet a weekend on it so you can see just how good this bike really is! Oh, and it's still available for Moto GP weekend... Better grab it fast, cause it's gonna go fast now that we've announced it! 5/18/11 - Diavel !!! And other bikes. RentaDucati.com is very pleased to announce that we have added the brand new Ducati Diavel to the stable! Here it is up at the Palomar Mountain General Store. Riding the Diavel is an initiation to the unexpected. The power is great and comes on smoothly, but strongly given the 162 bhp figure. What is entirely unexpected is how agile this bike really is and how composed even at significant lean angles. It goes, handles, is beautiful, and is a Ducati after all! And for all you lucky people reading this, it is available to rent! Other bike news: we added another 848 Superbike to the line-up with carbon fiber Termi's, Ohlins TTX shock, Ohlins steering damper, smoked screen, and solo seat. Now, riders in Santa Barbara as well as San Diego have the opportunity to ride the amazing Ducati 848 Superbike (currently winning AMA & WSBK races regularly)! We also have an extended range tank on the Hypermotard, so perfect for the long road trip. We are excited to announce that our second corporate location is up and running at Ducati of Santa Barbara (link) in Santa Barbara, CA! We have added a red Multistrada 1100S to our fleet and moved the Hypermotard 1100 to this location. We've updated the Santa Barbara local page (here) with all kinds of good info to plan your next trip. We look forward to seeing you there! Ducati Island, sun, fast bikes, and unfortuantely only a second place poduim finish for Mr. Stoner. Well, it was still a great race and of course a great Ducati showing by all the fans. One of our founders, David, was there to take it all in and enjoy the weekend. Here is to hoping we have a guy on the top next year (perhaps Rossi?). Announcing the immediate availability of our full range of bikes at 5 new locations! You asked, we listened, so make sure to check them all out. Local info on each new branch is coming, but in the meantime feel free to book online today! More locations are in the works, so keep checking back to hear about new openings or subscribe to our newsletter to the right to be one of the first to hear. Ducati had a strong showing at the 2009 MotoGP races at Laguna Seca in Monterey, California, and we were happy to be there to watch! Check out our pictures of the Ducati Island, Casey Stoner, and Nickey Hayden here. Also, this marked the first anniversary of Rent a Ducati.com! That's right, a quick year has already gone by. Can't wait for next year, and hopefully this time with it a podium finish! Puma recently came out with new bike shoes, and you know what that means... new advertising pictures! We were lucky enough to have one of our bikes featured in the shoot - see a few of their pictures here. Of course we don't recommend this type of riding, but it makes for great press shots! 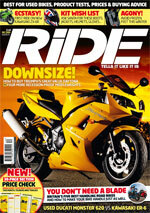 RiDE UK Magazine published a special "fly-and-ride" story about their recent three day trip to San Diego riding our Monster 696 in their December'08 issue. They took some great shots of the deserts, mountains, and sea side - see a few of their pictures here. The story is great, but it may be a tough for most of us to check out since they are based in the United Kingdom! Maybe you can check them out at your nearest enthusiasts magazine store. 7/4/08 - Open For Business! Rent a Ducati.com has launched and is open for business! Our first location is in San Diego, CA at GP Motorcycles and we are renting out an 848 Superbike, Hypermotard 1100, and Monster 696. This picture is of our first renter taking the Hypermotard out for the weekend. Come on by to see the bikes, and we look forward to renting one to you soon.